NASA astronaut Nicholas Patrick, STS-130 mission specialist, poses for a photo between two Extravehicular Mobility Unit (EMU) spacesuits in the Quest airlock of the International Space Station while space shuttle Endeavour remains docked with the station. Two astronauts will float outside the International SpaceStation late Thursday to attach a new room and long-awaited observation deck tothe orbiting laboratory. Endeavour shuttle astronauts Robert Behnken and NickPatrick will venture outsidethe space station at 9:09 p.m. EST (0209 Friday GMT) to begin more than sixhours of construction work to install the new connecting node, called Tranquility,and its window-lined observation portal. The astronauts had to do some last-minute changes fortheir spacewalk today when a power harness on Behnken?s spacesuit failed. They hadto cannibalize a spare from a spacesuit on the space station. ?So I?m basically going out with a different suit thatdoesn?t have that power harness in it,? Behnken said late Wednesday in atelevised interview. ?So it shouldn?t give us any more trouble.? The spacesuits are modular so they can be tailored for anastronaut?s size and comfort. So Behnken will still be able use his fitted leg,arm and glove attachments from his old suit. 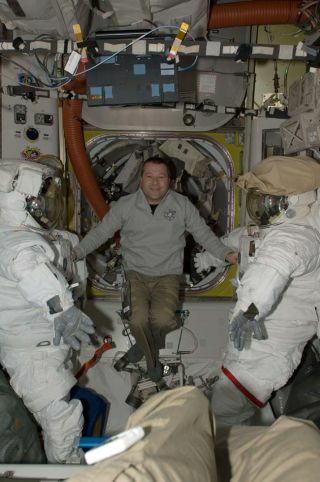 Behnken is the spacewalking chief of Endeavour?smission. Patrick is making his first spacewalks on the 13-day spaceflight.Both are veteran spaceflyers. Thursday night?s spacewalk is the first of three planned excursionsby Behnken and Patrick to install and activate the new Tranquility room andobservation deck, which is known as the Cupola. The new additions are NASA?s last big pieces for thespace station. They launched aboard Endeavour on Monday and arrived two dayslater when the shuttle docked at the orbiting lab. The space station will be 98percent complete once Tranquility and the Cupola are installed. About the size of a small bus, Tranquility is acylindrical module about 24 feet (7.3 meters) long and nearly 15 feet (4.5meters) wide. It was named after NASA?s historic Apollo 11 moon base and weighsalmost 40,000 pounds (18,143 kg). The $382 million module will be the home for thestation?s life support, exercise and robotic arm control systems. It will beattached to the left side of the station?s central Unity module. The Cupola is a seven-window observation portal with a centralround pane that is the largestspace window ever launched into orbit. The $27.2 million portal launched onthe end the Tranquility module and will be moved to an Earth-facing side of theroom later in the mission. All 11 astronauts aboard the linked station and Endeavour arelooking forward to the new views of Earth and space promised by the new windowunit. Both Tranquility and the Cupola were built in Italy forNASA by the European Space Agency. The $100 billion space station is theproduct of 16 different countries and has been under construction since 1998.